Indian temples are a rich repository of the religious, cultural, and artistic life of the society. Of special importance here are the circular, intricate, and artistic patterns called the mandalas, which are placed in the bhuvanesvar of the temple that is conceived as the microcosmic representation of the cosmos in a temple. The study of the significance of the maz4a1as are based on the aspects like symbolism, fractals, numerology, and sacred geometry that are used as codes to reveal the mystery of the universe and the eternal laws that govern the order of the universe. The diagrams of man ça1as, concealing vast and grandest knowledge of science and spirituality in an amalgamation, are condensed to simplest graphic designs so that the knowledge of science was accessible to the commoners. The study presents the structural, philosophical and scientific perspectives of some maii4alas belonging to the earl Calukya, late Calukya and the Hoysa4a temples of south India. 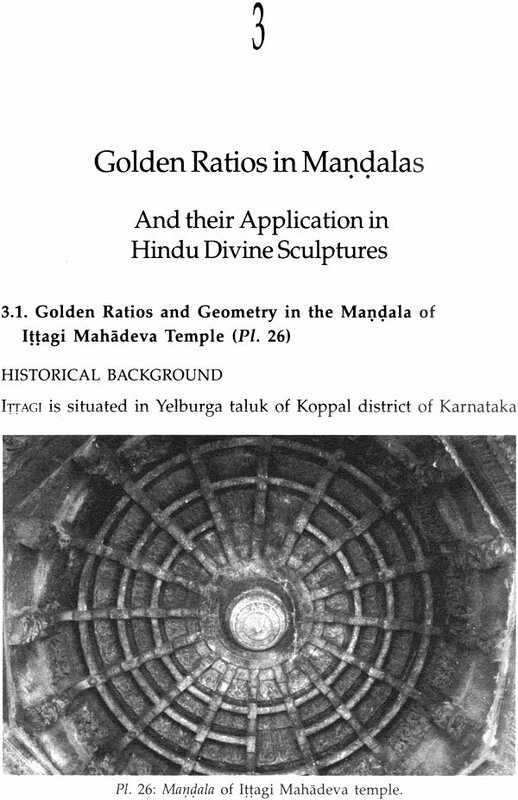 The research work also explores the study of the Golden ratios on which the mandalas and the divine images of the temples are designed. The book will prove extremely absorbing to scholars concerned with the study of the art and architecture of the ancient divine sculptures. Rekha Rao has a master’s degree in Indology from University of Mysore, India. Her interests in the temple sculptures have made her visit and study various temples in India. Rekha Rao is an accomplished dancer in Bharatanatyam and other classical styles, and is well trained in Karnatic instrumental music. She has the honour of “Natyaratna” from The Academy of General Education, Manipal. Rekha Rao is widely travelled, enjoys studying historical monuments. She has contributed three research papers for the “Visvakosha” The encyclopaedic work on ancient history and archaeology published by the University of Mysore. She has also participated in subject related seminars and authored books on: Therapeutics in Indian Sculptures — Ranki Vav’, Patan (2006) and Apsaras in Hoysala Art —A New Dimension (2009). DURING my work on the apsarases of Belur temple, my attention was drawn towards the bhuvanesvari — the central ceiling of the assembly hail of the temple, which had not caught my attention in the past. I was amazed at the volume of work and wondered why it was placed so high, even though fixing such a wonderful piece of art, in a dome shape, was a Herculean task for the sculptors. My curiosity made me observe the diversity of patterns in the bhuvanesvari of other temples, which, though looked beautiful, did not reveal any information about the purpose in installing such beautiful art forms of geometrical patterns, so high in the ceilings. In spite of being a student of history and culture, the unfamiliarity and lack of understanding with these varied designs in the bhuvanesvari aroused my interest to know more about them. The superficial curiosity, followed by enquiry, led me to the quest of finding the data associated with the circular designs, mandalas as they are called, carved in the bhuvanesvari. It was amazing to study the intricate and different patterns in each circular design — mandalas in temples, as each one appeared like a model for cosmic diagram, concealing vast knowledge of the organisational structure of life. Most of the books on mandalas said that mandalas had something to say on the cosmos, but it was not clear in what way the mandalas were associated with knowledge of cosmos. It was on the advice of Dr S.R. Rao I was instigated to work on a scientific orientation to these circular designs, the mai4aIas of the bhuvanesvari in the pillared hall of the temples, as art, science and spirituality, all three appeared to be merged into one. He also motivated me to study the book, Synthesis of Science and Religion, a compilation of 32 essays by renowned scientists and philosophers, which made me realise that relation between science and spirituality is like part and a whole. Religion ultimately leads to spirituality, so also science. Science and spirituality are the two ways of looking at same things; both are with the approach to truth. One is subjective and the other is objective. Science leads by logic and spirituality by intuition, both adding dimension to the knowledge of the supreme power. Science proceeds in part by observation, giving clues to what is real, true and ultimate with matter that is visible, without giving a slightest thought to the idea of God’s existence. But religion and spirituality deal with the supernatural, based on natural world-considering reality as a whole. The development of the knowledge of science decays in the absence of spirituality. Hinduism with its practical wisdom understands the reason, yet retaining its tradition. The common question that arises is — why should there be science involved in mai4ala designs of temples. In the early and medieval period of Indian history, temples were not merely places of worship but they were also an indispensable part of society with various responsibilities. They were centres of education, fine arts and promoted the cultural heritage among the masses, especially the younger generation. Our ancestors were eager to understand the world and they also knew that the scientific approach was the most powerful and elegant way to know about the cosmos. Science interprets nature through reason and experimentation. Krsna says in Bhagavad-Gita that he is the reason in knowledge which helps to conclude that science is one form of divine manifestation. Ancient philosophers knew that scientific laws pervaded nature, the nature of earth, sky and also the way the world worked. The Upanisads say — padartha jnanat moksam — the knowledge of cosmos, even in a fraction, leads one to moksa (liberation). According to Mundaka Upanisad, two kinds of knowledge need to be known, by the jijnasus (the seekers of knowledge of Brahman). They are the lower knowledge (para vidya) and higher knowledge (apara vidya). Apara is the knowledge of the four Vedas, six Vedangas, to understand the field of nakatra gad (the science of astronomy), and ganita (the science of mathematical calculations including arithmetic, algebra, and geometry). Para knowledge was beyond this and focused on the attainment of Brahman. A rigorous study of Vedas and Vedangas revealed the approach to the attainment of ultimate truth (the Brahman), which was the goal of life. Science deals with apara vidya — the material knowledge, whereas spirituality deals with pan? vidya — the knowledge on the spirit that is enduring and maintaining the equilibrium of the universe. If the knowledge of one’s body, its components up to the atoms and molecules, gained through sensory perceptions — is apart? vidya, the knowledge of the conscious living being (atma), transcendent life, and God is part? vidyas?, which is experienced through the discipline of yoga. The science of apart? vidya? studies the nature of an atom outwardly, proving its existence by experiments, but part? vidya or the theology explains how to become an atom and experience the oneness with the nucleus, that is, the vital centre. Apart? vidya is much like the scientific knowledge of calculation — the ganita Sastra and engineering skills involved in building a long-lasting and huge temple that houses God — the soul within. Science develops on logic satisfying the physical body and senses while spirituality develops intuition satisfying the mystic experience of soul. One can see God through science. As explained by Swami Vivekananda, we can go to the limits of this universe, but we shall still find God spread out beyond. We can dive deep into the heart of each atom of matter, only to discover that we have entered a greater realm of his power and glory. The manifest universe is a very small part of his glory and power. We try to gnsp this truth with our puny little mind and senses, and all that we can clasp is a pebble as nature does not reveal glories once and for all. Mandalas in the bhuvanesvari of the navaranga hail of temples, like flashes, bring to light the hidden truth existing around the governing laws of nature, which can now be considered as the documentations, recording the scientific achievements of our ancestors in an ornate and artistic expression. The mystery of science deepens, as we advance and dwell in this field — so also in spirituality. There is an unending mystery in both science and spirituality. The more we try to know about this world, or self, the better is our understanding as to how little we know about it. A fusion of facts and dreams are in mandalas. The purpose of installing the mandalas in temples was for upliftment, and to pass on the knowledge of how things are in cosmos. Mandalas were probably like the medium, to fill the ignorance gap by explaining the concepts that everyone needs to understand. It is intended to encompass the mainstream fields of not only spirituality but also physics, mathematics, architecture, biology and so on. One can feel that the complex scientific details are condensed and simplified into an artistic looking design that even non-scientific people can appreciate the scientific concepts that rule the universe. Mai4alas can be seen as an attempt to make science look like a series of ideas and not a complicated body of facts — with the intention that as many people as possible should have a basic knowledge of science. But, just like the map of a country will not represent the whole truth, but will faithfully represent some aspect of it, mandalas indicate some aspects of the science as understood during that period, because in ancient times the study of physical sciences was neither formalised nor separated from other branches of knowledge. The underlying scientific principles of the way the world worked was amalgamated with the spiritual thoughts and the tnav4alas of temples thus became an approximate awareness of science. However, the application of the laws of physics and an insight into the branches of science as per the ancient rational treatises can be seen practically documented in the bhuvanesvari of Hindu temples. They are no doubt crucial to humanity to compare with the present stage of knowledge in the fields of physics, chemistry, botany and other physical sciences. As an example, when the mandala of Belur Cennakesava temple was considered, the central deity was Lord Narasimha, a deity of “Tejas” when presented in a mandala (or the cakra (wheel) of Visnu in symbolic form) it is read as a sudarsana yantra. A study on sudarsana yantra revealed that there are two varieties of it like jyotirmay and vangmayi sudarsana yantra, that bear a relation to the faculties of sight and sound. When the properties of light was studied, it matched quite well with the pictorial form of mandala of Belur in a subtle way. 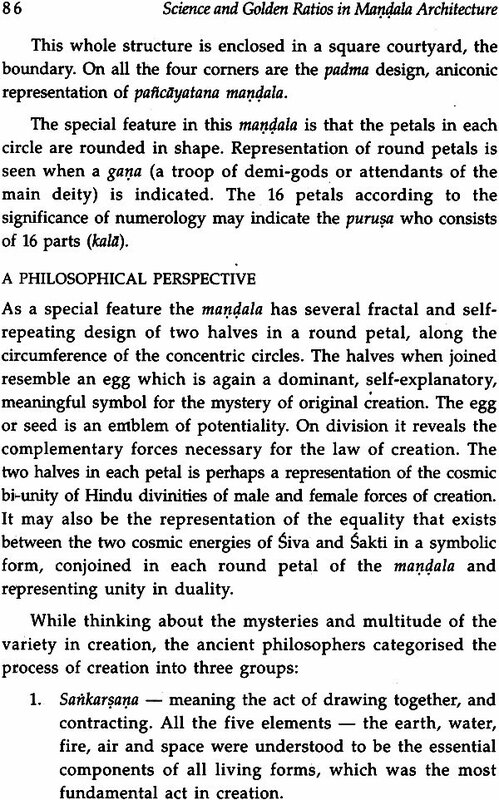 Similarly the shape of petals and progression in the number of petal divisions of the Keladi Virabhadra temple tallied quite well with the properties of sound, which reinforced the logic that the temple mandalas are the representations of the aspects of science in a hidden form. Through this study, I would like to present a few thoughts on the relationship that was existing between spiritual ideas and the ideas of scientific advancement, co-exhibited in the mandalas of ancient temples. It is an attempt to trace the scientific advancement of ancient period that lay hidden in the mandalas and draw the parallels between laws of physics to metaphysical Ideas. Science is an ongoing process that never ends. There is no single ultimate truth in science that is achieved, after which the scientists can retire. It operates under the guidance of paradigms — the structure of the scientific revolutions and the progressive knowledge that is taught to the new generation of scientists. The advances in technology solve many problems of the world during calamities, but are unable to help in solving some of the personal problems of man that cannot be explained on material basis in the abstract thoughts like beauty of love, compassion, self-sacrifice, and so on. It is this aspect of life and consciousness that theosophy helps to explain where methods of science lead to chaos in the deeper and inner aspects of truth. Both science and spirituality are aimed at satisfying the inquisitiveness of humans on the three planes of consciousness like the body, mind and spirit. But spirituality gains an upper hand, as the knowledge of Brahman (Atman and spirit) is an experience that is beyond the domain of logic and proof, whereas science orients more towards the gross and physical body with logic and proof. Einstein, prophet of the redemption of matter, declared that there is no logical way to the discovery of these elementary laws and the only way is by intuition. Ancient Hindus adopted a scientific approach to discover the supreme power Brahman in self. This book is an attempt to refer to science as understood by the people of ancient times. The analysis is based on the symbolism and significance of the sacred numerology of Hindu traditions. In temples, the mandalas in the bhuvanesvari observe a dome shape with three-tier or three-level wave pattern usually. Even though the intention is to give a continuity of the designs with the three levels of the body, it is because of the architectural treatment that a huge circular design is presented at three levels with the purpose of giving strength to the mai4ala structure. It gives an illusion of a two-dimensional picture to the human eye. The inscriptions of the temples speak about the gods that were installed, provisions made for the services in the temple, grant of revenues and the titles of the king. There is hardly any information about the ceiling panels, even though some temples had more than 10 or 12 designs, each different from one another. 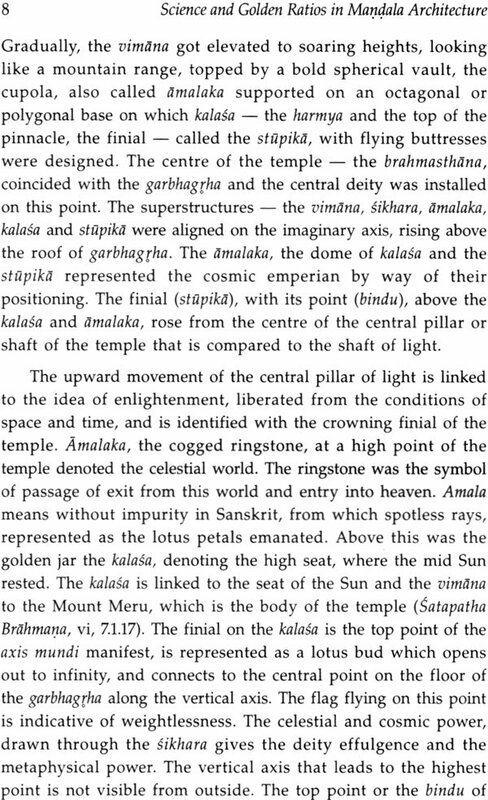 Inadequate documentation of the ceiling designs in books dealing with archaeology no doubt posed an obstacle, as the personal photographs of the bhuvanesvari mandalas did not do justice for the lack of light in the zone of the mandalas. The choice of mandalas is at random, but based on geographical preferences of Karnataka state of southern India. The mandalas in some of the temples of early Calukya, late Calukya and Hoysala periods are analysed with both the philosophical and scientific perspectives in this book. I express my thanks to Dr Paniveni Udayashankar, professor and H.O.D. of department of physics, NIEIT, and visiting research scholar, Indian Institute of Astrophysics, Bangaluru, for reviewing the physics aspects of the manuscript. My sincere thanks to Varun Eshwer, a computer engineer, for the computer graphics in this book. I am grateful to the Archaeological Survey of India, Bangaluru and Dharwad for providing me photographs to illustrate my presentation. IEMPLES in India were centres of art, places of religious exposition, cultural and educational centres. Even though an individual or a single family was responsible for financing the temple construction, it was not considered as their private property but it belonged to the entire community where people assembled for religious services. They were huge establishments, coordinating all aspects of religion and social interactions, of economic and local life. They were like art galleries, and many incorporated a hall for concerts, and lectures and transactions of local affairs as forms of art were believed to gain access to spiritual ideas. Because of the expanded responsibilities, temples often got associated with mathas which played a role in the expansion of a temple into an organisation. 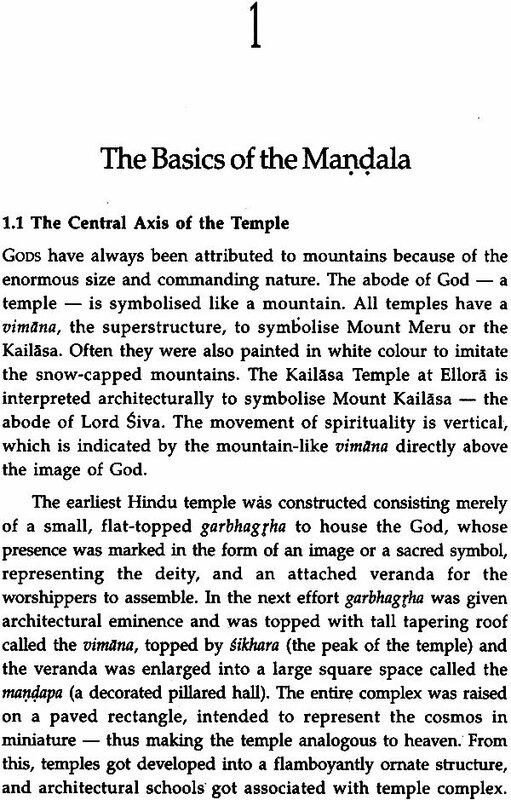 Since temples also played a role in educating the students in the field of Vedic studies, grammar, science and related subjects other than the cultural subjects like dance, music, and the art of carving sculptures, temples got evolved. The area of the pillared hall got expanded in the plan to accommodate more number of devotees; number of pillars in the assembly hall also grew in numbers, involving different and intricate patterns. And the domical ceiling of the hall, the bhuvanesvari, was used to bring out the various aspects of the cosmos in an artistic way. The soul of God was conceived to be present in the idol of the deity in the garbhag1ha. 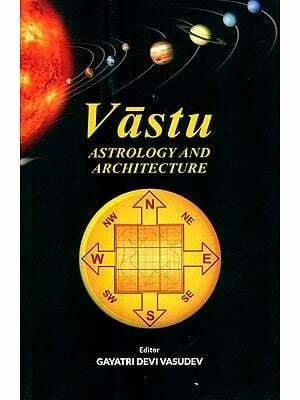 The whole cosmos was presented through geometric and symbolic form in the bhuvanesvari. 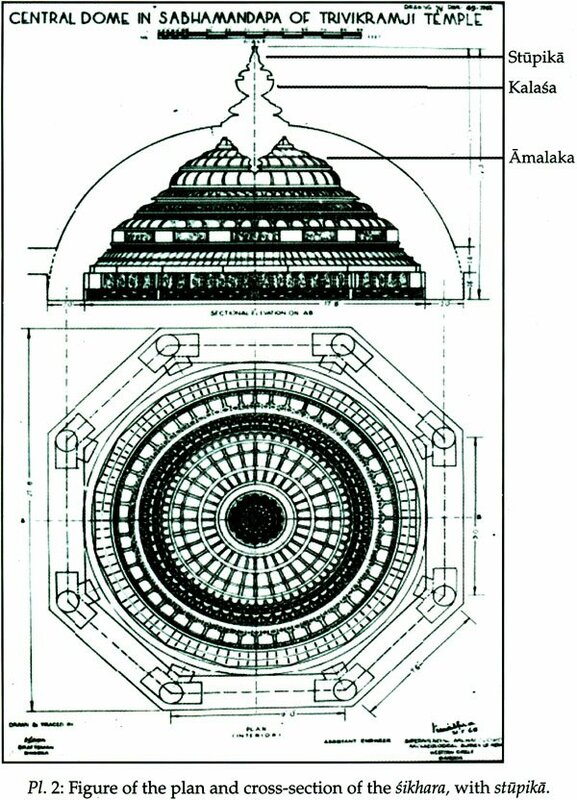 Since it was sacred knowledge, it was placed high in the domical ceiling — the sacred space — and also it served the dual purpose of not only decorating the roof of the pillared hail but also as montessori designs to enlighten the viewers about the various aspects of the laws of nature. Area of the outer walls was changed to a stellate design so that more area was created to carve the sculptures of Puranic stories and the dancing sculptures of apsarases. Garbhagrha – the sanctum sanctorum. In the inner sanctum sanctorum, the deity was installed and worshipped. The vigrahas or the figures of worship (the vigra has of worship) were in two forms, viz. sarupa and arupa. In sarupa form, divinities were manifestations of the unmanifest eternal, figurative and carved / shaped after the human anthropomorphic form. The sculptures of Visnu, as Ananta4ayana or Padmanabha are the typical examples of sarupa form. They are often projected with one or more unnatural or impossible factors such as four hands or multiple hands and heads or half human body with the head of a lion or an elephant to indicate that they stand for something other than material objects and superior power as they are apparently seen. 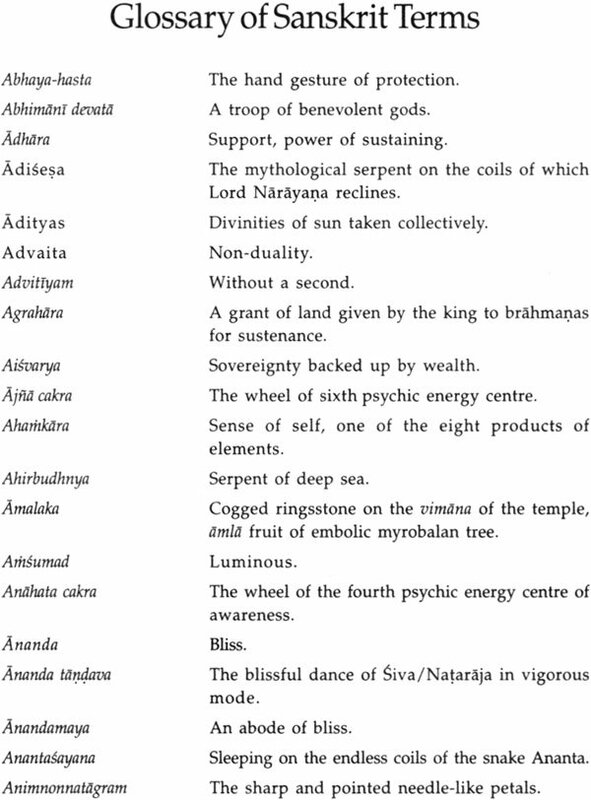 Arupa was perceived as the formless symbols of an iconic non-anthropomorphic form, where the 4akti of the supreme power was conceived to be present in a saligrama or linga (phallic symbol of Siva), or were abstract, with geometric patterns as seen in the power diagram of yantra — the Sri-yantra, where purusa and prakrti were conceived in an undifferentiated form. Yantras and mandalas are the power diagrams of a particular configuration with the elementary geometrical designs that function as thought forms about the inherent forces and the nature of the cosmos. Maz4aia — a Hindu word meaning a sacred circle is composed around a central point, which is the point of unmanifest primordial energy, and has to be visualised in the mind while contemplating and meditating. Mandalas in stone in the domical ceiling are symbol of forces, thought to exist within inanimate matter. God is beyond human imagination, but the omnipresence of God was visualised in any form. In ancient culture, qualities of permanence, strength, and integrity were heightened and given sacred significance in an individual standing stone or stone amulets as durable symbols of life forces. Stones were used to mark sacred places and a focus place for worship or meditation. 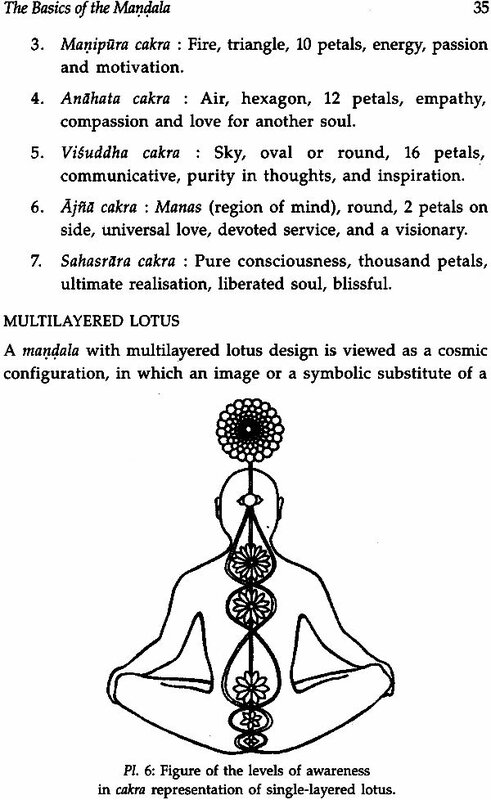 In general, the diagram of a yantra and a mati4ala has three components. 1. The central point or the bindu. 2. The concentric circles called valaya around the point bindu, constituting the body of the mandala. 3. The protective square boundary around the maiz4ala called the bhupura. The central point called the bindu is the symbol of purity, a source of positive energy and the residence of God. It is also seen as the “Life” — from which, for which and around which all things manifest. It is symbolic of the eternal potential and inexhaustible source of power, from which all seeds grow, develop and realise their function. It can be compared to the nucleus of an atom without which even the atom does not exist. The body of the mandala is an expansion of the central point, represented as concentric circles, in which are some divisions, manifestations of the five elements and fractal representations (ref. ch. 1/11 for fractals) of the central point indicated by the geometric patterns. All these are designed at a definite distance from the centre, observing a well defined, bilateral order with symmetry and equilibrium. The concentric circles are covered by a protective square boundary — the courtyard and the palace of the inner being, called bhupura. In all mandalas, the first principle of bindu is constant; the body varies according to the nature and theme of the particular maz4ala and the square boundary is again constant. The yantra also contained the sacred circle or the valaya of mandalas, in which the gunas or the aspects of God were conceived in geometrical forms like a circle, triangle, square, hexagon, octagon, or like a lotus with the petals in varying numbers. Any aspect of the supreme principle is bound to the central spot through the geometrical contrivances. Even though structurally both yantras and mandalas resemble, the basic difference between them is that the yantras are small in size, are worshipped as they are believed to be effective only when worshipped. Maiz4alas are mostly on permanent material, big, larger than yantras, with the representation of whole cosmos and are beneficial when drawn, recollected or just visualised. 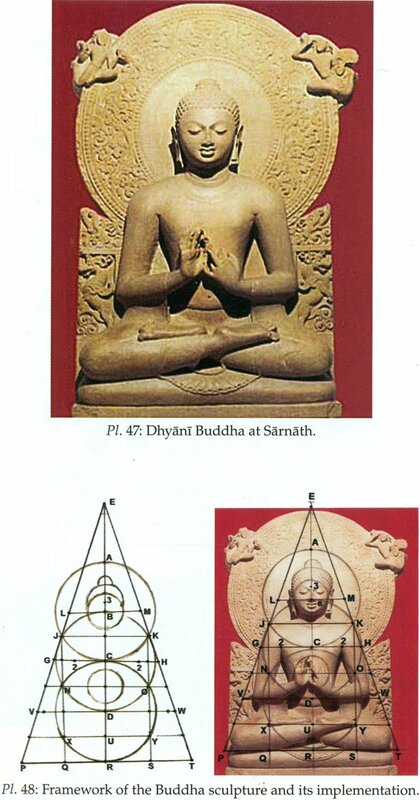 Pictorial representations are also seen in mandalas but in yantras it is mainly symbols and the man trashed syllables). Yantras can be moved from place to place whereas mandalas are not moved. Unlike mai1alas a yantra may or may not have the central point. The Suprabhedhagama explains that a mere viewing of the mandala cleanses one from all sins. The concept behind is that it is for the darsana — viewing of the exterior form of God who inhabits a mandala. Our ancestors were eager to understand the world. The cosmic creator, nameless and formless, was seen as far back as Rgvedic days as a great stream of cosmic energy. Over a period of time, human mind preferred to anchor to an anthropomorphic form of God for his prayers and meditation, on which he could concentrate. All aspects of the unseen cosmic power, which was infinite in nature was expressed in an anthropomorphic figure or was represented as mai4alas — the sacred circles with various geometric shapes. 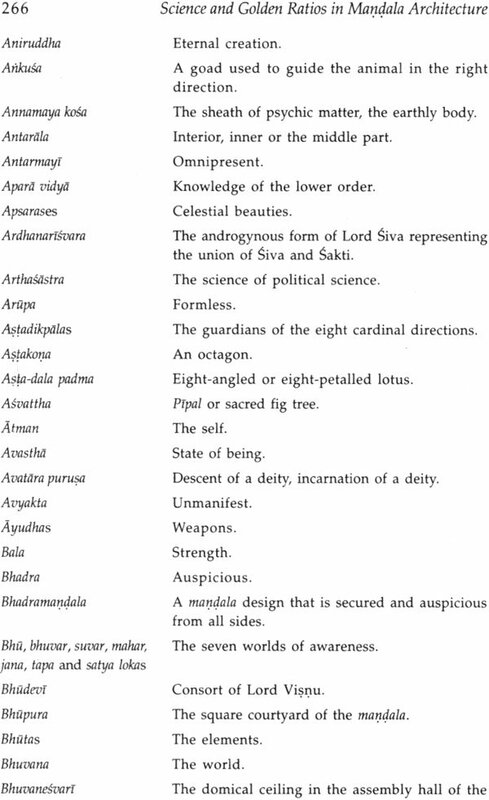 Ancient Hindu literature stressed that God is one but his aspects are many. As it was impossible to worship him in all his glory and fullness, some aspect or the other of the lord was chosen to approach the divine power. Certain symbols, material, verbal or mental were taken up either singly or jointly to glorify God. The symbols, though not a reality became just a means of remembering the lord through the association of ideas. No doubt, God as supreme power was seen in both arupa and sarupa forms. 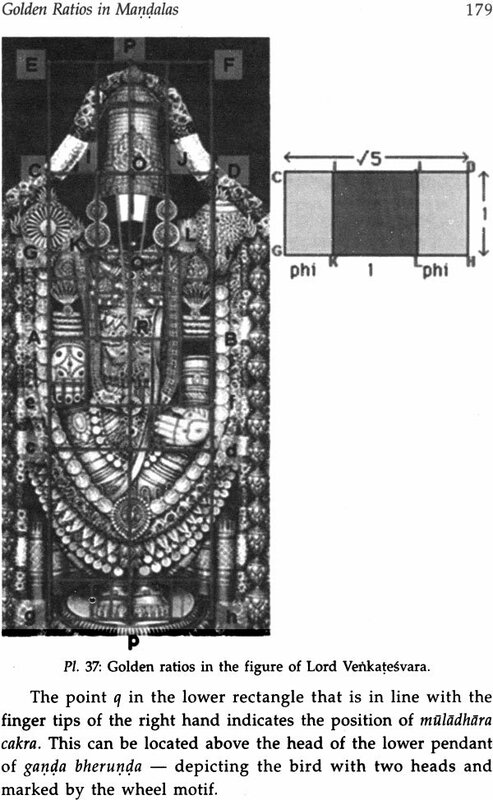 If the soul of cosmic power was seen in the sculpture of God, the body was seen in the inai4alas. Like any other physical body, the organs and limbs were seen in the tattvas associated with it. Mat4ala gave the representation of the universe, highlighting the cosmic and divine powers, as the universe is believed to be the manifestation of the deity. Visnu Samhita (9.69) states that all constituent parts of the universe are the manifestations of the deity. Mandalas were thus the sacred circles, which revealed the eternal and universal law in which the order of the universe worked, in an abstract and symbolic way. Understanding the nature of the mandala was the key to the understanding of ritual as a universal process and the art of mar4ala was intended to uplift the mind to spiritual levels. Though the mandala is a universal constant, it is also an act of faith and an integral part of a personal vision quest. Each mandala in temples is venerated for what it represents. The devotee looked upon the divine form as an embodiment of the attributes that reveal the supreme principle in some way or the other. This divine idea further became a symbol of reality that is at the root of everything. Image worship kept within the limit, whether in sarupa or arupa form, can serve a very useful purpose of stimulating devotion, prompting religious art, creating mythological literature and as symbols of spiritual ideas. Unless these forms are seen with the required consciousness, the figure of deity and the symbols of a mai4ala are reduced to a mere design. Mai4alas are for focusing the attention of the aspirants. Visualisation is also an aid or a tool in meditation and spiritual teachings, helping to deepen the levels of one’s awareness about the ultimate. Most of the circular mal34alas in the bhuvanesvari are in low domes of saucer shape. The saucer-shaped structure, a feature of the interior design, plays an important role in places of worship, as it is symbolic of heaven not only in Hindu but in Islamic as well as Christian places of worship. When viewed from below, it resembles the shallow concave shape of a saucer. The shallow dome is often contained in the space between the ceiling and attic and decorated by ornate work. The place of maz4ala is high in the ceilings of the hall because the sacred diagram that is believed to be a source of mystical power enhanced the levels of peace, tranquility and positive energies in the devotees who assembled in the hall of the temple and hence was revered for its contents. Traditional Hindu rituals observed certain social practices of emphasising on the abstinence of devotees during the inauspicious periods from liturgical ends and human interactions like touching the power diagram were to be declined during these periods. The roof of the pillared hall was thought to be one of the ideal places to install the big designs. The other reason being that the dome has a great deal of structural strength. The components of a dome are held together by compressive force and they can withstand the shocks of the natural calamities to a great extent.